Are you ready to find out more about Cats, Chaos & Condo Board Wars? Most events run smoothly for Hilary, but occasionally, one goes awry and a client turns…evil. Relieved that her boss knows <i>that</i> type of client, Hilary quickly jumps into her next event, planning two parties for a <i>very</i> handsome executive. “Fairway Towers is smack dab in the middle of downtown, in one of the trendiest neighborhoods”. And it’s where my new favorite character Hilary Brandt lives with her friend Luna. Hilary’s Grandpa left his condo to her after he died. Hilary is an accomplished event planner and according to her own report, she is also “A huge workaholic. A big pushover. I make stupid decisions based on my emotions. I don’t date. I’m a terrible kisser. 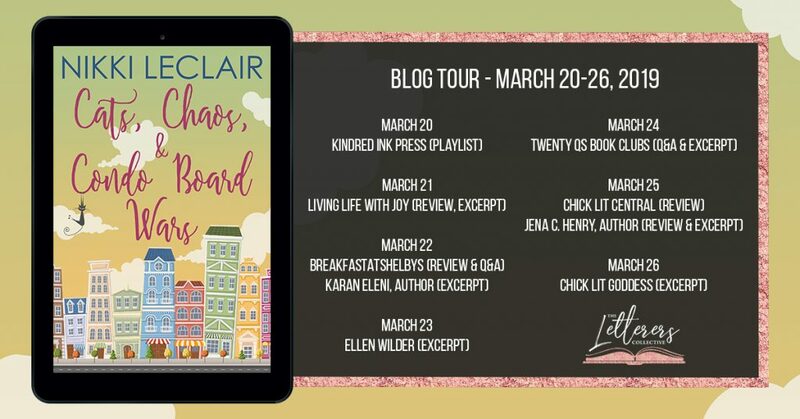 I can’t be mean.” If you are a fan of Nikki LeClair, you know that this author creates awesome characters that are so much fun to read about. And she’s done it again with Hilary. In addition to Hilary, this book has more entertaining characters than a condo board has regulations. From the other condo owners, to Hilary’s co-workers and clients, there is always plenty to smile about. Will Hilary run for the Board Presidency and will she win? Maybe, but she has many other issues to deal with. Her boss wants her to land a special account. Warren, an event client seems to be very interested in her. Her co-workers Eli, Jasmine and Marco are always into something. And then there’s the disappearing, intriguing guy, Neil. Plus, an unexpected kiss. And don’t forget about Board President Glover and all her tricky schemes. Every page of this well-written and creative book is filled with delightful plot twists and many surprises. Hilary is lovable and her fun spirit shines through the book. 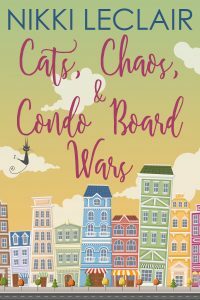 Extra stars for crafting a darling, amusing and engaging book about a condo board war! Highly recommend. Many thanks to The Letterers Collective for an ARC. This is my honest review. Thank you Karan- I love working with you and Nikki! Another fun read from you, Jena. Many thanks! What a fun book and review!!! One I think I would love!! Thanks for another great review.